"Flambe Dreams" is a new musical comedy that was enjoyable to sit through. 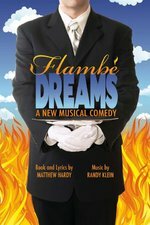 Written by Matthew Hardy and music by Randy Klein, "Flambe Dreams" is the story of "Joseph Christiansen," played by "Jersey Boys'" Jarrod Spector, who aspires to be a great Maitre d' like his father, played by Kevin B. McGlynn, who was tragically killed in a freak flamming Banana Foster accident. Wanting to pursue his dream, against the wishes of his mother, played by Tony Award nominee Catherine Cox, "Joseph" moves to New York in hopes of being a Maitre d' at Le Cirque, one of NYC's famous restaurants. Along the way, he meets "Gloria," a pharmacist at Duane Reade, played by Jillian Louis and "Desiree/Delicious Dish," played by the hilarious J. Elaine Marcos, most recently as the ping-pong poppin' "Cynthia" in Broadway's "Priscilla Queen of the Desert." As "Joseph" pursued his dreams many lessons were learned along the way about life, love, lies, and parenting. I was very entertained during the show while being taught a few good lessons. In a very funny way, "Flambe Dreams" showed me what a parent will go through to protect her child from hurt, even when it may not be the best thing for him. It also showed what one person will endure to reach his dreams, even when it seems like they won't come true. It also highlighted what a few people would do to find love and how far they would go to get it. The whole cast should be applauded for their comedic talents, though J. Elaine Marcos did steal the spotlight several times when on stage. She really utilizes her improv/stand-up comedy skills to bring her moments just that much further. Jarrod Spector and Jillian Louis were both very funny in the way they capitalized on their characters' neurosis. Catherine Cox was delightful playing "Joseph's" mother especially when she felt he was doing something he shouldn't be. Catherine found a way to embody the crazy of the mother. Kevin B. McGlynn shined in each of the characters he played: "Joe's" father, "River," the owner of "River's Holistic Tearoom," "Yashinoya," the owner of "Speedy Happy Noodle Shop and Internet Cafe, and "Emile," the head Maitre d' at Le Cirque. Kevin found a great way to make each character stand out in a hilarious way. Overall the music was enjoyable. I particularly liked "Mr. Christiansen," "Helping Children," "Chatroom," "Table For One," "Lesions On Your Heart," "My Dream," "Letting Go," and "Everything You Long For." These songs really stuck out for me because they were either written with much wit or they really gave some insight to the character. I hope this show has more of a life after NYMF. If it does, I might suggest trying to trim it down to just under 2 hours or re-work the ending because I did think the show was over after everyone sang "Everything You Long For," but then there was about another 10-15 minutes. Although, "Everything You Long For" would have been a fitting ending, but it was nice to see the actual ending, so maybe there is a way to smooth that out. "Flambe Dreams" is fun, humorous, and enjoyable. The run is already sold-out but there is talk of a possible addition. Stay tuned to "Call Me Adam" to find out! "Flambe Dreams" has added one more performance: Friday, July 20 at 11pm! Click here for tickets!